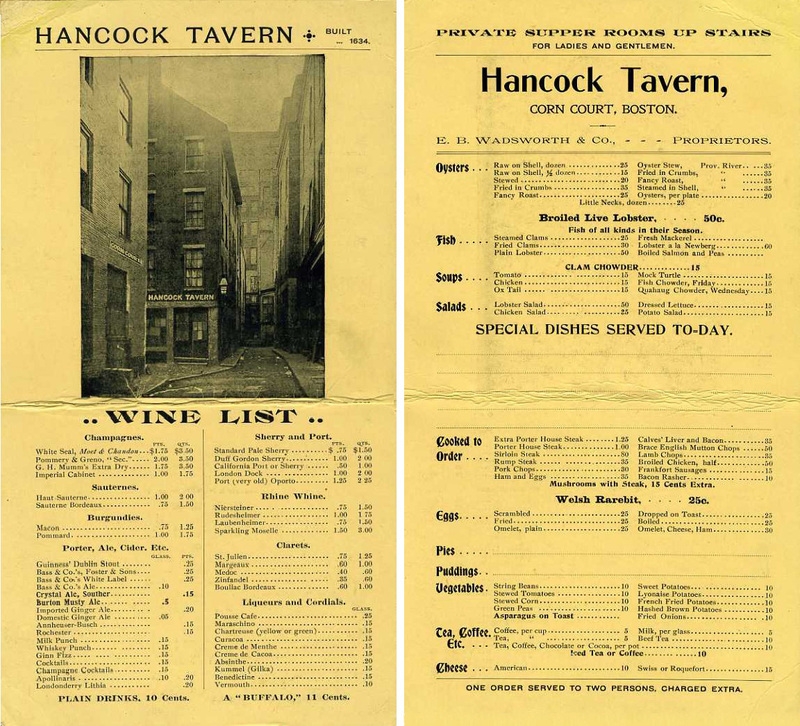 When I found this menu from Boston’s Hancock Tavern [shown front & back] at a flea market my first question was how old it was. As soon as I began researching I learned that proprietor Wadsworth & Co. had taken over in 1897 and that the building pictured was torn down in the spring of 1903. That narrowed things down. At that point I thought I knew enough to consider the question of the tavern’s history, starting with “Built 1634″ as noted on the menu. Then, everything began to unravel, including the menu’s date. Then I found a story about a menu like mine found in a collection of items related to the Hancock Tavern — similar except that it said “Visit the Historic Tea Room Up Stairs. In this room the ‘Boston Tea Party’ made their plans, and dressed as Mohawk Indians to destroy the tea in Boston harbor, Dec. 16, 1773.” Since mine simply says “Private Supper Rooms Up Stairs for Ladies and Gentlemen,” I decided that it probably dates from the reincarnated Hancock Tavern, which would put it between 1904 and approximately 1910. 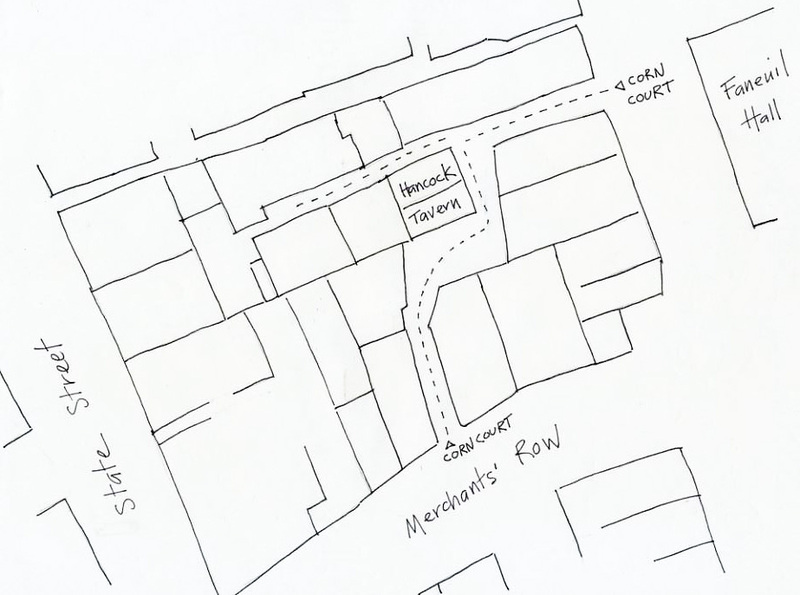 Much bigger mysteries surrounded the history of Hancock Tavern. By the late 19th century legends about the tavern abounded, beginning with the notion that it dated from 1634 as the continuation of a tavern begun by Samuel Coles. It was also said to have hosted John Hancock, exiled French king Louis Philippe, George Washington, Benjamin Franklin, and French foreign minister Talleyrand. But the grandest legend concerned the conspirators in the “Boston tea party.” Beginning in the 1880s, the various proprietors of the Hancock Tavern spun historic tales about this. 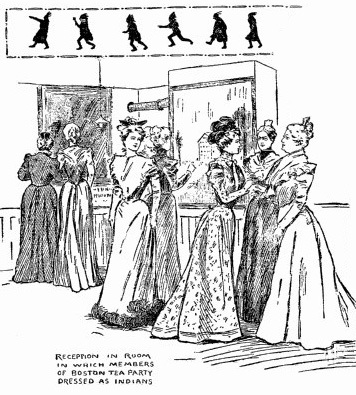 In December of 1898, the Daughters of the American Revolution, dressed as Colonial maids, met at the Hancock Tavern to celebrate the 125th anniversary of the tea party. On the wall was a somewhat more detailed inscription, likely put there by the Wadsworths: “In this room the Boston tea party made their plans and dressed as Mohawk Indians, and went to Griffin’s (now Liverpool) wharf, where the ships Beaver and Eleanor and Dartmouth lay, and threw overboard 342 chests of tea, Dec. 16, 1773.” Later, the Wadsworths produced a souvenir booklet of historic lore. But the link between the tavern and the Revolution, as well as its ancient status, were thrown into doubt in 1903 when City Registrar Edward W. McGlenen announced that the just-razed building that had housed the Hancock Tavern had been erected between 1807 and 1812. Furthermore, he said, its predecessor on the same site, a two-story house, had not been granted a tavern license until 1790, ruling out any associations with the Revolution. He also showed that Samuel Coles’ Inn, reputedly built in 1634, was an entirely separate property, thereby demolishing the Hancock Tavern’s claim to be Boston’s oldest tavern. The legends, he said, had developed from a number of fanciful books and articles from the 19th century that were in conflict with town records. And so my menu, though still more than 100 years old, lost some of its charm. I also realized how much turnover there was in the tavern business. During most of the 19th century the Hancock Tavern was leased out to a succession of proprietors who either handled its alcohol and food service or the entire operation, which included lodging. It fell on hard days sometime before the Wadsworths took over in 1897. Their energetic attempts to raise its historic value may have sprung in part from the fact that it had spent some years as a gambling den. In a city with many old buildings, most Bostonians did not care about it. What does “A Buffalo” for 11 cents mean? Good question! It’s a drink, but I have no idea what kind. Hi Jonathan, Wish I knew how Crackerbarrel Alley got its name. The only thing I can tell you is that I was able to find it on an 1873 map of Northampton. It might have been there earlier but the 1860 map lacked detail. If you go to Historic Northampton’s website you can see it in 1873 and also in 1884 where it is very clear and leads down to a bakery. Could there be a connection?